What is Swiss franc LIBOR? On this page we show the Swiss franc LIBOR rates. 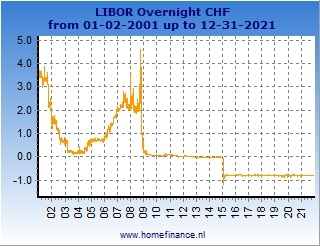 The Swiss franc LIBOR rates can be considered as the interbank cost of borrowing funds in Swiss francs. In the following table we show the current Swiss franc LIBOR interest rates (one day delay, daily updated). 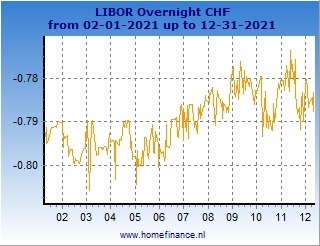 The left charts show all the Swiss franc LIBOR rates from the start. The right charts show the rates during the latest 12 months. You can select all available Swiss franc LIBOR rates (maturities).